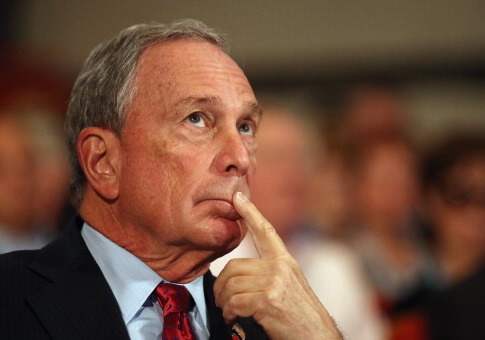 An environmental center within New York University's School of Law that was created and funded by former New York City mayor Michael Bloomberg has been executing a tightly knit public relations strategy with "progressive" state attorney general offices (OAGs), according to multiple emails obtained through open records requests. Critics of such arrangements say that media coordination between NYU's State Energy & Environmental Impact Center (SEEIC) and the OAGs raises ethical questions because of the attorney-client relationship between states and attorneys general. The SEEIC's methods generated some controversy after the Competitive Enterprise Institute, a free-market think tank based in D.C., published a lengthy exposé last August backed by reams of government documents showing that the law center was paying for their own attorneys to be placed with OAGs across the country to do extra work on energy and climate litigation. 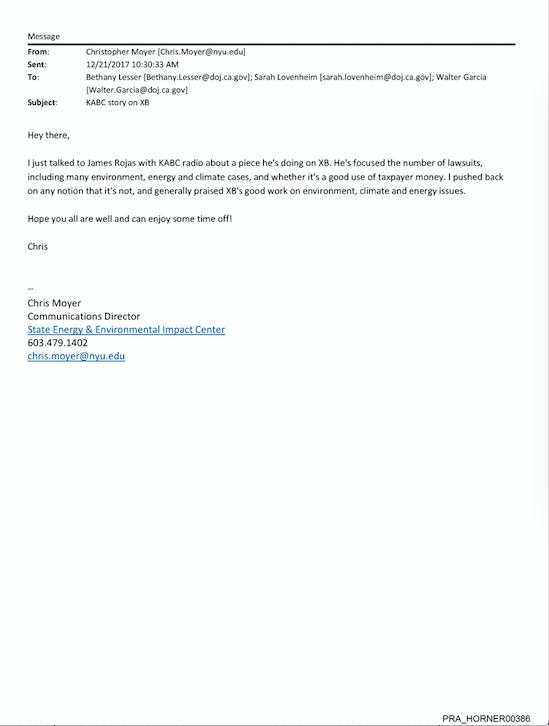 "We're based in DC and work on legal and communications strategy with AGs around the country who are promoting and defending progressive policies on clean energy, the environment and climate change," reads an email from the communications director of the SEEIC to an AG's office sent in August of last year. Some level of coordination is to be expected and may not be particularly noteworthy. However, some of the emails uncovered in the latest records requests "go beyond simply asking for retweets, etc. because they are more akin to organized political campaigns that are conducted on an ongoing basis," according to Marquette University professor Paul Nolette, who tracks OAGs and has authored a book on how OAGs influence public policy. 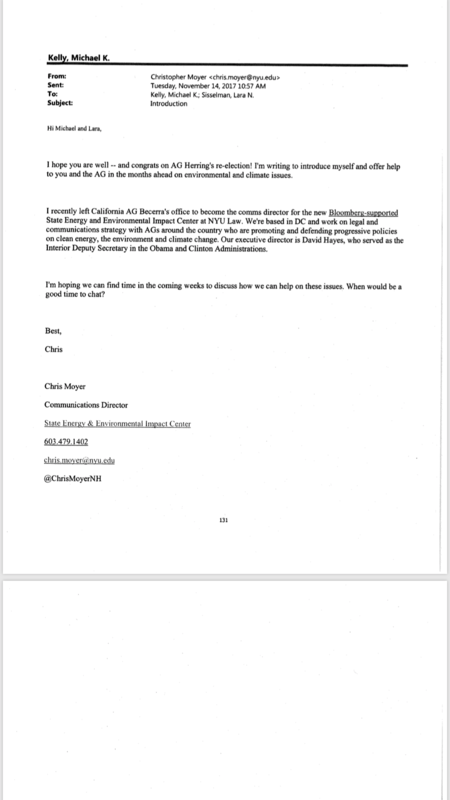 An email from December of 2017 from the SEEIC communications director to the Calfornia AG office shows that in some cases, there were attempts to help directly shape a media narrative by making person-to-person outreach to reporters, and "push[ing] back" on potentially problematic or unfavorable narratives. "I just talked with James Rojas with KABC radio about a piece he's doing on XB [California Attorney General Xavier Becerra]," the email said. "He's focused on the number of lawsuits, including many environment, energy and climate cases, and whether it's a good use of taxpayer money. I pushed back on any notion that it's not, and generally praised XB's good work on environment, climate and energy issues." Another email thread between the same two parties from January of 2018 gives another example of person-to-person outreach to help positive media stories move forward. After the Washington Post published an article called "California just can't get enough of suing the Trump administration," the SEEIC communications director touted the efforts of his office to the California AG's office. 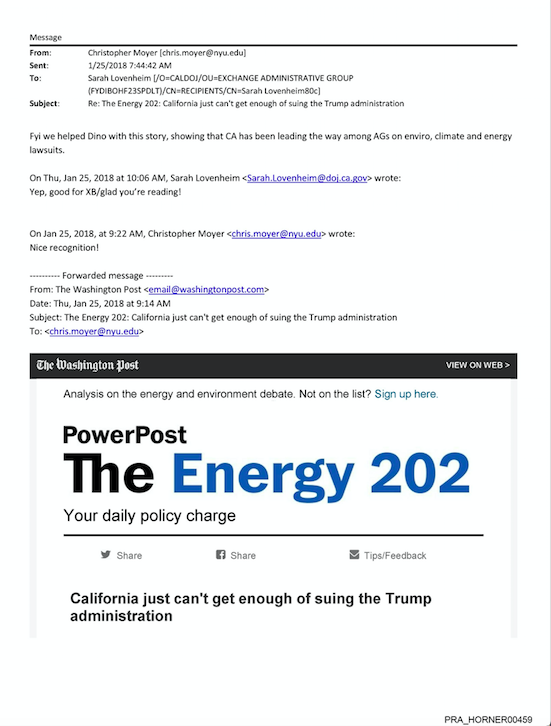 "Fyi we helped [Washington Post reporter Dino Grandoni] with this story, showing that CA has been leading the way among AGs on enviro, climate and energy lawsuits," the email read. Emails in that particular thread only indicate that the reporter named was the target of the SEEIC's media coordination, and do not suggest any improper or unprofessional behavior on his part. A request for comment was also not returned. Other emails between the SEEIC and the Illinois Attorney General's office appear to show attempts to pitch and place the AG to television producers for on-air hits. 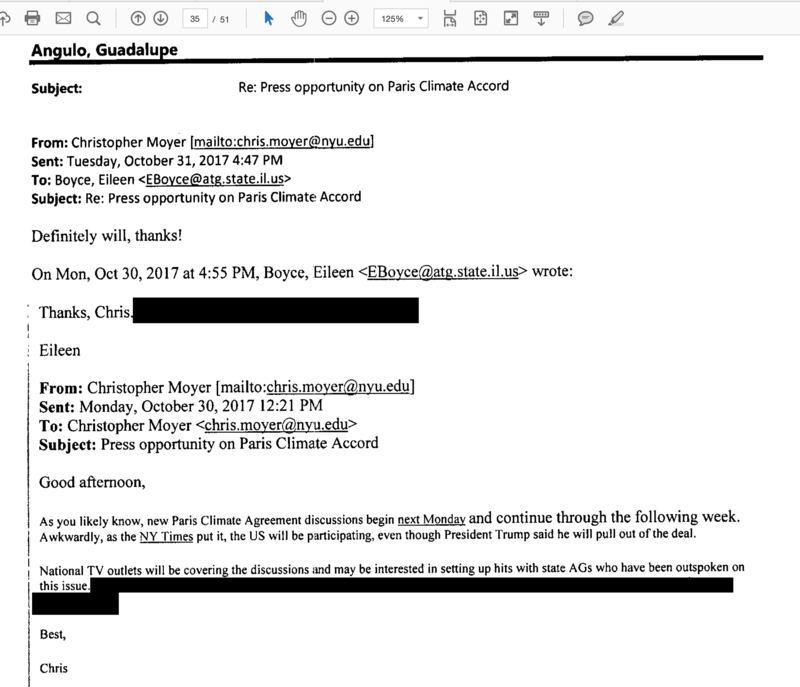 "As you likely know, new Paris Climate Agreement discussions begin next Monday and continue through the following week" one such email began. "Awkwardly, as the New York Times put it, the US will be participating even though President Trump said he will pull out of the deal." "National TV outlets will be covering the discussions and may be interested in setting up hits with state AGs who have been outspoken on the issue. [Redacted sentence.]" A similar scenario appeared in October of 2017, when the SEEIC emailed the Illinois AG office regarding flood policy. "We appreciate your boss signing on to the attached letter calling for congressional leaders to reinstate the flood standard in the wake of devastating hurricanes over the last two months," the email began. "We will be pitching a few reporters on this today and tomorrow. [Sentence redacted]." The very fact that emails discussing public relations strategy have redacted sentences is a red flag to Chris Horner, who obtained the emails in his efforts with the Competitive Enterprise Institute as well as another project called Government Accountability and Oversight. "These AG offices are citing a mixed bag of ruses to hide select portions of media-related emails between their PR aides and the Bloomberg group's PR staffer," Horner told the Washington Free Beacon. "The redacted correspondence between media aides hidden behind claims of privilege don't appear to be related to litigation, but instead simple PR with an outside activist that they don't want released for political reasons," he concluded. Nolette says coordinated efforts like this began to emerge in the 1990s when numerous OAGs sued tobacco companies and "several public health advocacy groups worked with AGs and the class action attorneys hired by the AGs on litigation and PR efforts." "[M]y broad concern is that these burgeoning networks muddy the AG's attorney-client relationship," Nolette said in an email to the Free Beacon. "Traditionally, the AG's client was the state. This slowly began shifting, starting in the 1970s, when AGs began characterizing their role as representing ‘the public interest'—a subtle and important shift from the traditional state-as-client role." "More recently, however, these new ideological networks represent another shift in which AGs may now be representing outside interests in at least some of their litigation. This raises many ethical concerns, particularly given the nature of expanded AG powers nowadays," Nolette said. "I mean this in a broad sense—ethical concerns when the instrumentalities of government power are used to benefit private ideological or industry interests." The SEEIC, the California AG's office, and the Illinois AG's office all did not respond to requests for comment. This entry was posted in Issues and tagged California, Illinois, Michael Bloomberg, New York City. Bookmark the permalink.